Introducing a scent that perfectly captures the myth of a generation. Surrounded by sleek wood notes and citrus flowers, this clean, penetrating fragrance melds bohemian influences with today's structured sophistication. Bergamot, Narcissus Absolute, and Sandalwood reveal a mesmerizing deep character filled with light, movement, and nostalgia. Forging new ground in the floral-infused, citrus blend, woods category. Jardin Secret is a modern olfactive interpretation of a beautiful garden, intoxicating, hypnotic and rich in floral notes, where thousands of flowers bloom. The top notes evoke the brightness of daylight and the dewy freshness of flowers, with vivid bergamot, yellow mandarin and neroli. The heart reveals a fresh, blossoming bouquet of magnolia, narcissus and rosa centifolia, with sensual touches of Jasmine, Iris, orange blossom and Ylang Ylang—before settling into a softly rounded base of sandalwood, amberette seeds [sic], white amber and modern musks. 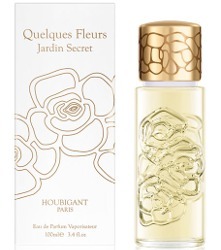 Houbigant Quelques Fleurs Jardin Secret is available now at Neiman Marcus, $190 for 100 ml Eau de Parfum. I have all the assorted QuelQues, and I will definitely hunt this down to try, but did they really use “forging new ground” in the same sentence as citrus, floral and woods?! And kudos to you; I remember when I was new to your site and still lurking that you said you thought woody florals would be the next thing. I know just what you mean, but hey, just look at all the flankers to Acqua di Parma Colonia — 1916!